On arrival at the Paro International Airport, our representative will meet, assist and transfer you to your hotel in Thimpu, the capital city and home to Bhutan's royal family. Overnight. After breakfast, enjoy a sightseeing tour which includes the Folk Heritage Museum, National Library, Handicrafts Center, the indigenous Medicine Hospital, the Painting School and from the road, glimpse Tashichho Dzong. Visit Takin Zoo where you will find Takin, the national animal also called cattle chamois or gnu goat. It is a goat-antelope found in the eastern Himalayas. Afternoon, visit National Memorial Chorten, a stupa dedicated to the third king of Bhutan and Buddha statue. In the evening take a walk to the main city from Clock tower square. Overnight. Breakfast. Drive to Punakha valley touching Dochula pass (10,000 ft) and stop at Hongtsho village. Stop at the immigration check point to stamp in your permit. 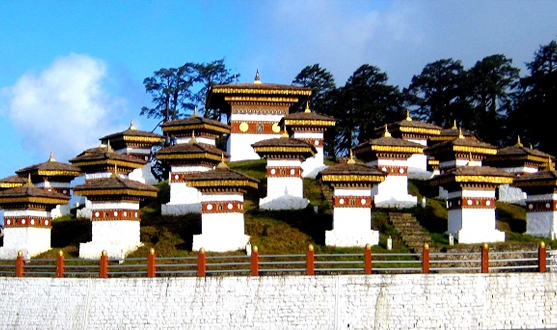 Drive through the first mountain pass and see the 108 Druk Wangyal chortens on the top. In clear weather you can see the highest peaks like the Gangar Punsum one of the highest unclimbed peaks (24,000 ft) in the world. 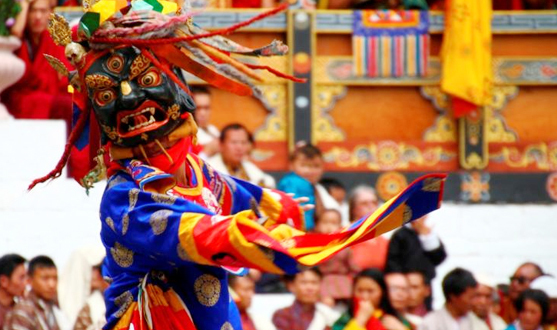 Continue through Thinleygang village, stop and take a short walk to Chimmi Lhakhang – 'The Divine Madman.' Learn more about him from your guide. 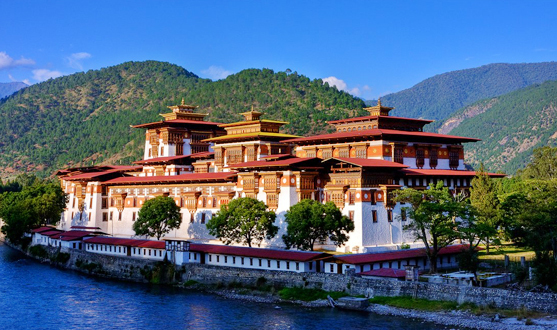 In the afternoon visit majestic Punakha Dzong at the junction of the Pho Chu and Mo Chu rivers. The dzong was built in 1637 by Zhabdrung Ngawang Namgyal as the religious and administrative seat of the region. It was here that the dual system of government was introduced in the 17th century. In 1907, the first King - Gongsar Ugyen Wangchuk was enthroned here. Evening at leisure. Overnight in Punakha. After breakfast drive to Paro and stop at Lamperi to visit the Royal Botanical Park for 30 minutes. If you are lucky, see red pandas and different species of birds. Watch a short documentary about the park. Continue to Paro via Semtokha and check in your hotel. Rest of the day at leisure. Overnight. After breakfast, visit Paro Dzong, the National Museum housed in a round fortress called the Ta Dzongand see its fine collection of natural and historic artifacts. Kyichu Lhakhang, the 7th century monastery is one of the oldest and most sacred. In the afternoon, visit the ruins of Drukgyel Dzong, a 17th century fortress that used to keep out invaders from Tibet. In 1951 the fort was destroyed by fire. Your last stop is at the base of the Tigers Nest. Evening visit the town for leisure or shopping. Overnight. Breakfast. Morning transfer to Paro International Airport. Package Price: Rs. 23,400 per person on double sharing basis. Accommodation in double occupancy room in hotels mentioned above or similar. Entrance charges as per the itinerary. All sightseeing by AC vehicles as per itinerary. Price valid for Indian nationals only. NRIs / Overseas guest are requested to contact us. Hotel mentioned above are subject to availability.